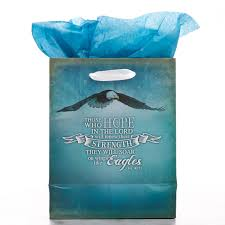 Designed in blue with eagle and Scripture verse, Those who hope in the Lord will renew their strength. They will soar on wings like eagles. Isaiah 40:31; Gift tag Especially for you; satin ribbon handles and one sheet of coordinating tissue paper.